Finally, the last snail mask review for the time being. I finally tried one each of the snail masks I own, with the exception of one or two recent acquisitions (those will be added to the next bee/snake venom post). Yours truly is more than glad to report back that my face is still intact. LOL. Claims: (copied from Sasa.com) contains astonishing filtered liquid of snail mucus that is a source of boosting vitality. Fully replenishes skin with its ample moisture to solidify skin's hydration barrier. In addition, a plant extract called Ceramium kondoi protects the exasperated skin against the external damage by supplying the necessary nutrition to skin. This unique mask helps to brighten and moisturize skin with its hydrating gel formula. The Sheet and Scent: I whole-heartedly adore the hydro-gel sheet texture and cutting. It is perhaps similar to all those gel/bio-cellulose masks, but this is amongst the best. Adheres to the skin like skin, doesn't move and no spaces left between mask and face. The cutting is marvellous with top and bottom 2 pieces and hugs the face contour. It carries a scent that fades, a bearable (not unpleasant) blend with hint of alcohol. My Reviews: A tiny bit tricky to put on as there are multiple inserts to separate the layers of mask. The feeling of it on the skin is great. It is very soothing, fresh and moisturising. If you hate mask that is dripping-wet, this is a good one to try. Effect is a significantly brighter and much nourished skin (not just moisturised). However, the after-feel of the skin is tacky. It took a (long) while for the serum to sink in and some may not like this feeling. I find it okay as I was sitting in an air-conditioned bedroom waiting to sleep - and I layer on skin care on top after a while. Price: gift c/o girlfriend Lorraine. I saw them asking for HKD155 (20 USD) for 5pc; while they are only 7,000 KRW (6 USD) in Korea. Claims: Provide deep, long-lasting moisture. Stimulate collagen growth, and promote skin renewal. Revitalise. Brighten. Smooth. The Sheet and Scent: 'A' grade for the cutting, because it is very nicely cut and has eye lid part (which I don't care for actually). Fit my face very well and carries right amount of serum. This mask is overly perfumed - just normal random floral fragrance of some sort. My Reviews: First of all, grumble about the whole 'Food Therapy' thing on the packaging. Snail is not fresh plants or fruits, and if it is to be eaten, I believe we consume escargot cooked not raw? :S Rant not over yet. The scent is unbearably strong. All through the mask I feel like a bottle of Eau de Toilette tipped over, sitting on my face and I can't breathe. The smell won't fade. Anyway, sorry, but this mask is a fail. Price: This came in a Glamabox. Claims: Fast revitalization and elastic skin, relaxation of trouble from damaged skin and recovers with clean skin. The Sheet and Scent: Decent light scent. Texture or thickness of the cloth is mediocre, but the cutting is really bad. My Reviews: First of all, What grammar is it with the product claims? That aside, the cutting is really not satisfactory. Obviously my skin isn't as 3-dimensional as it is designed. The thin sheet doesn't hold too much serum, so 20 minutes is max for air-conditioned room. I actually really love the results after taking this off; skin is tight and firm and bright, looks great and feels amazing. Not the most moisturising though. Claims: Regenerate, protect skin from stress and environment. The Sheet and Scent: Barely-there soft fragrance. Sheet is gel type and has a lovely cutting - 2 pieces for lower and upper part separately. Texture is on the flimsy side though, there is mask bits falling off when I move around the mask. My Reviews: Like that no serum dripping at all for the entire 15, 20 minute duration. Skin is not too wet but 'soaked up' with hydration I feel. Some mask bits left over on face, not too pleasant. Need cleansing, wiping with a toner on cotton pad afterwards. The Sheet and Scent: Traditional rather thick sheet. Nice cutting, hugs my face very nicely. Light pleasant scent. My Reviews: ToO tOo sticky, the solution is. A lot of spillage too, on desk, when I pull the mask out. Serum/solution is like glue. Skin feels very tight afterwards. Definitely need washing post-mask. Price: from Glamabox, normally retails for under $80 for a box of 7 at Mannings. The Sheet and Scent: Great soft well-cut fabric. (you may refer to old pic of mine here - I have a long criminal record of documenting my masking faces...) Light, barely there fragrance, can't describe. My Reviews: Love. Very moisturising and nourishing. My lack-of-sleep lack-of-care travelling skin was tamed and treated with just 1 go. Will repurchase! Claims: "promote skin cell regeneration, leaving skin back to life, to reproduce a feeling of abundance elasticity, best offer for the skin of moisture and nutrients." "hyaluronic acid to add moisture to dry, dehydrated skin" "Effectively soften the flaky skin, promote water and nutrients to be able to penetrate deep into the underlying muscle." "Fill dry skin with water molecules, achieve translucent skin." "Improve skin ability to repair itself to the ultimate suppleness"
The Sheet and Scent: Same as below. Reviews: Mr. A used this on the night before the photoshoot. I made him used this mask. He generally has oily and blemish-prone skin. This didn't break him out and his make up on the day after stayed put. Note: this also didn't burn his eyes. Rating: N/A - as basically he slept through the mask session. Claims: Stop melanin formation, restore fair skin complexion in no time. The total destroy of spots, freckles, to create a uniform colour. Keep skin moist and smooth. The Sheet and Scent: The sheet is nicely soaked with serum, and I adore the texture and its cutting. 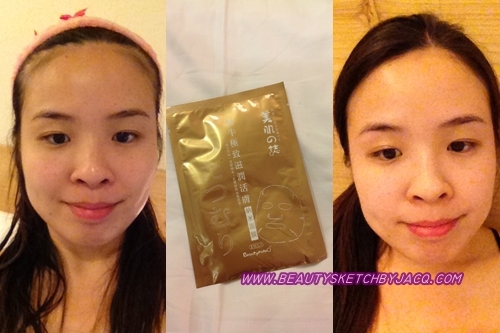 The sheet is like a net/gauze, adheres to skin very well, and holds the serum too, minimal dripping. The scent hardly smells of anything. My Reviews: Save this for the last as I was afraid it will burn my eye balls like the previous one. Unlike the first one (link) I tried, this doesn't irritate my eyes. I adore the moisture and brightness after using this mask. Great one to use and try, especially love the texture of the sheet. The next mask review will be on Bee, Snake Venom (and their 'synthetic' dupes). Has your impression with Snail Masks changed any, after reading my several episodes?